And, of course, if there's a golden retriever, I'll find her. Meet Sadie (and Jennifer from New York). Why do we meet the best buddies while traveling? Wednesday was "ruins day." I visited sites in Tulum and Coba and the latter was definitely the stand-out. I arrived as it opened and hired a Mayan guide who'd been working there for 12 years, so he really knew his stuff. Tulum, on the other hand, was very crowded and touristy. It reminded me of going to "see the redwoods" at Muir Woods. Two photos from Coba - the huge pyramid is the only one in Mexico you're still allowed to climb. I don't go to the theater very often, but when I do, I'm reminded of how pleasant the experience can be. This holds true even when the movie isn't "all that." 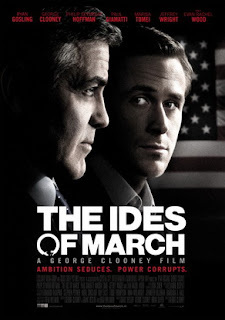 Such was the case yesterday when I saw Ides of March. So predictable, it was almost boring. Well, it WAS boring - until the big plot secret is revealed - maybe 30 or 45 minutes into the movie. That said, watching good actors and beautiful people - like George - is always pleasant. This flick came with a decent recommendation from family and friends, so I'd love to hear what you think. I love, love, love this neighborhood sushi place. Cute place, great ambiance, reasonably priced sushi. Last night, I took Mike and Kristine there and introduced them to my favorite roll - the Volcano! 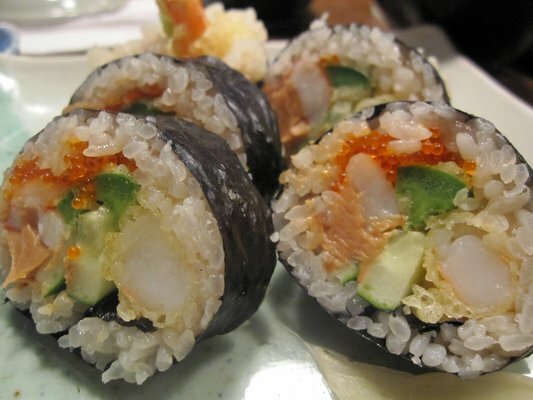 It's an unusual mix of shrimp, jalapeno, cucumber and ... peanut butter! Not as weird as it sounds. I promise. A group of friends and I checked out Dong Baek, the Korean restaurant adjacent to my apartment building. 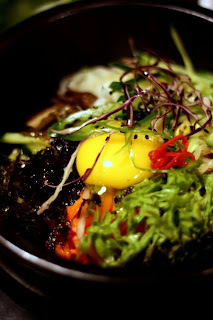 I had hoped to replicate the awesome food I enjoyed in Seoul. While it definitely fell short of that goal, it was an interesting culinary experience. The vegetarian bibimbap was definitely the highlight for me. 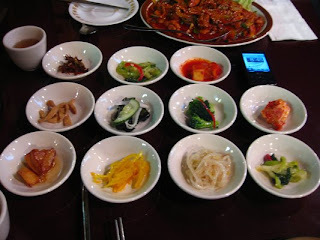 But I also really love the banchan or little dishes of pickled and spicy yummy things. 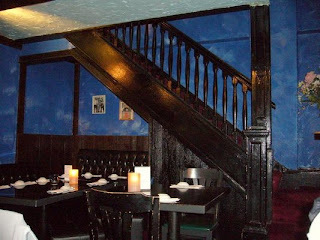 I'll definitely be back - but maybe just for take-out as the service was lackluster. Sugar pie pumpkins are different than jack-o-lantern pumpkins. The former are used for cooking, while the latter are used for ... well ... jack-o-lanterns. I wondered whether pumpkin pie and other goodies would taste better with real pumpkin vs. canned. They only needed about 45 minutes in a 350-degree oven to become wonderfully soft and scoopable. I pureed the pulp, then drained it and popped it in the freezer. Minimal hassle for what, hopefully, will be maximum taste. I love my adopted city of San Francisco. I've lived here since 1998. When I'm not working, I love going out to hear live music, staying home to read a book (or three!) running, making dinner for friends and yoga. Guilty pleasures: America's Next Top Model, a ballpark hotdog with sauerkraut and drinking wine in my pajamas.